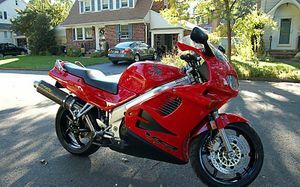 The Honda VFR 750 was a sport-touring motorcycle produced between 1986 and 1997. 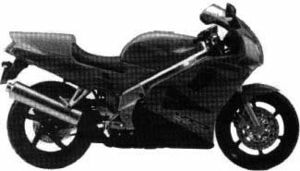 The fully-faired motorcycle was powered by a reliable 98 horsepower (73 kW) liquid-cooled DOHC V4 engine. The 1990-onward models sat atop a single-sided swingarm. 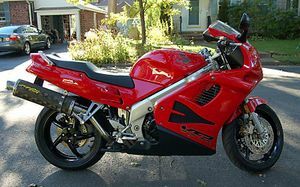 It was introduced as a complete redesign of the VF700/750F models to address some of the camshaft and bearing problems that had been associated with the first generation Honda V4 engines and improve Honda's negative image concerning this engine. 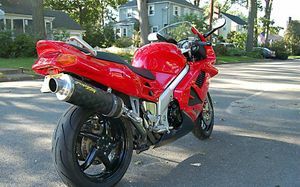 The new VFR750F featured greatly improved power output, lighter weight, a lower center of gravity, a wider front tire and a slightly longer wheelbase. 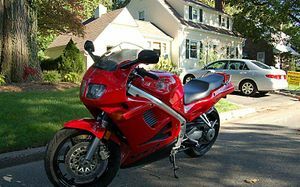 The VFR750 received many positive reviews and awards while in production, including winning the Best 750 cc sport bike award from Cycle World six years in a row. 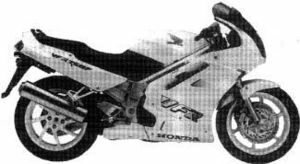 In 1986 Ron Haslam took a standard VFR750F to third place in a soaked Transatlantic Challenge race at Donnington Park. 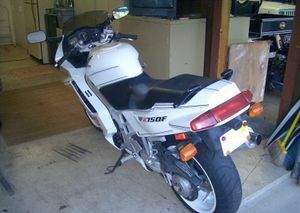 "Tarif beater" 700 cc versions were available such as the VFR750F in the US market due to the tax laws in place at the time. 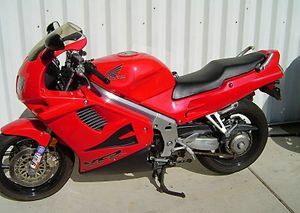 The VFR750 series all used a 750 cc 16 valve DOHC liquid cooled 90° V4 engine with carburetor-based fuel induction, the bore/stroke remained the same for all 750 models at 70.0 x 48.6 mm (2.8 x 1.9 inches). 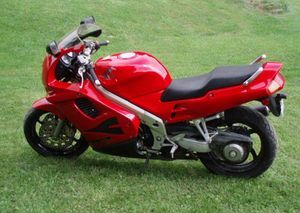 The engine is made of aluminium alloy with the crankcase being divided horizontally. Lubrication was via a wet sump and chain driven dual rotor oil pump, an oil (air) cooler is also fitted. 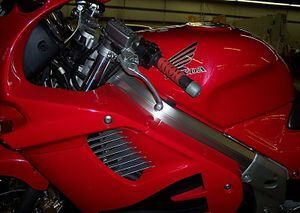 Transmission is 6 speed constant mesh, wet multi-plate clutch with chain drive to the rear wheel. 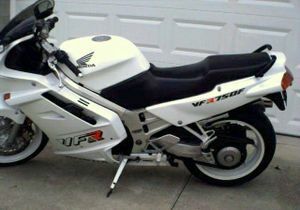 The V4 engine is highly reliable, with few known faults. The gear-driven camshaft system removed any concerns about cam-chain maintenance. 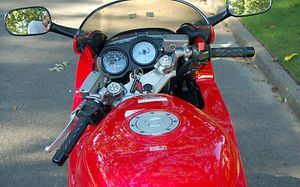 Valve adjustment on early models was by screw and locknut, changing in 1990 to shim and bucket, access was simple making the adjustment process painless on the very rare occasions when adjustment was needed - engines are known to reach well over 50,000miles without any need to adjust the clearances. Pre-2000 VFRs sometimes suffer from an overheated regulator/rectifier, a $100 part. While the replacement part is an improvement over the original, it has become commonplace for owners to buy a $10 CPU fan and glue it onto the rectifier. Spliced into the tail-light bulb wire, it provides extra cooling to protect the sensitive electronic unit. Early models sported anti-dive (adjustable on some models) on the front forks and a dual swingarm with remote hydraulic preload adjustment, changed in 1990 to a single-sided swingarm which remained with the bike throughout its life, and leads to the bikes' distinctive looks. 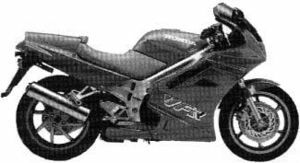 The arm was derived from the ELF race-bike Pro-Arm development work and has the advantage of allowing rear-wheel removal without the need to remove the drive chain and rear axle, and allows chain adjustment to be made very simply with no concerns about maintaining wheel alignment. 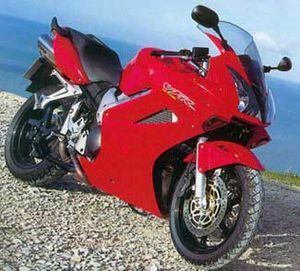 Related models from Honda include the VFR400 NC30 and RVF400 NC35, VF1000R, VFR750R RC30, RVF750 RC45, NR750 and VFR800. 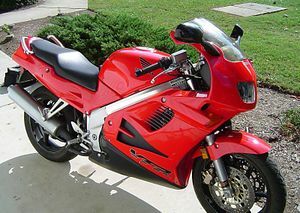 The VFR750F'90 VFR was sold in 1990 and was available in one color: Italian Red. 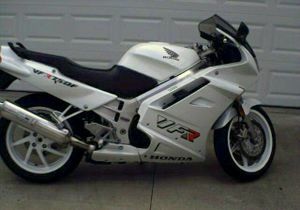 The wheels were white and the seat was gray. 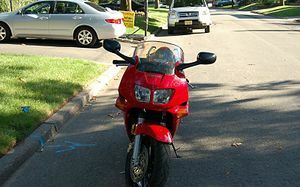 The headlight was a twin-bulb system. 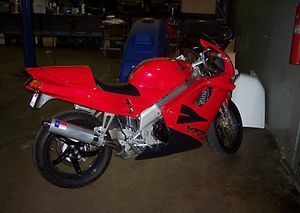 There was a single-sided swingarm. 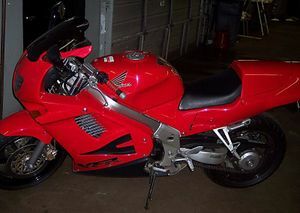 The engine was a 748cc DOHC 16 valve liquid-cooled V-4 linked to a 6-speed transmission. The serial number began JH2RC360*LM000009. 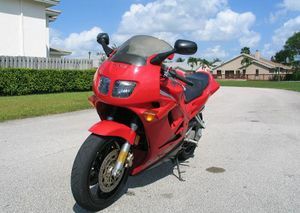 The VFR750F'91 VFR was sold in 1991 and was available in one color: Italian Red. The wheels were gold and the seat was gray. The headlight was a twin-bulb system. 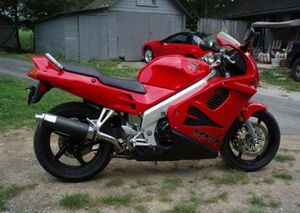 There was a single-sided swingarm. 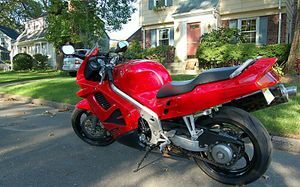 The engine was a 748cc DOHC 16 valve liquid-cooled V-4 linked to a 6-speed transmission. The serial number began JH2RC360*MM100001. 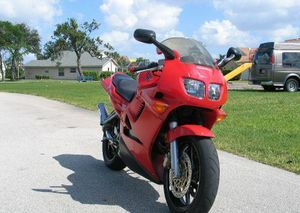 The VFR750F'92 VFR was sold in 1992 and was available in one color: Granite Blue Metallic (Black). 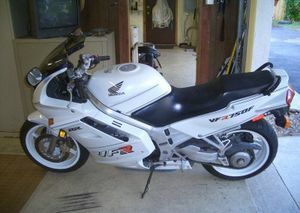 The wheels were metallic gray and the seat was gray. 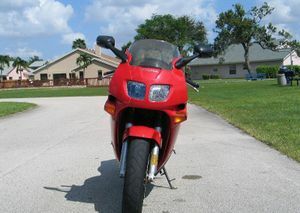 The headlight was a twin-bulb system. 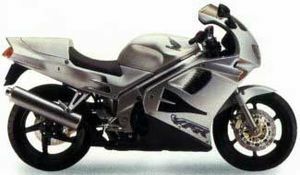 There was a single- sided swingarm. There was a revised suspension. 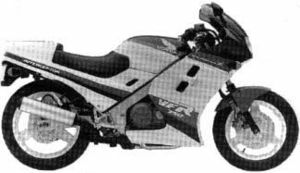 The "VFR" logo was silver with a purple outline. The engine had an increase in horsepower. 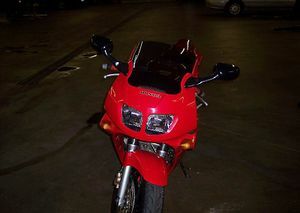 The engine was a 748cc DOHC 16 valve liquid-cooled V-4 linked to a 6-speed transmission. The serial number began JH2RC360*NM000009. 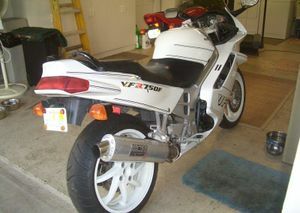 The VFR750F'93 VFR was sold in 1993 and was available in one color: Pearl Crystal White. 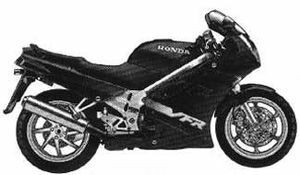 The "HONDA" logo was added to the lower cowl. 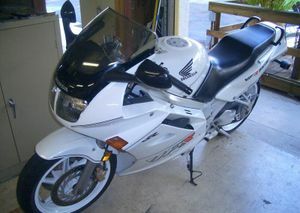 The wing logo was added to the gas tank. 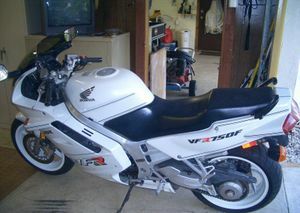 The "VFR750F" logo was added to the rear cowl. The wheels were white. The serial number began JH2RC360*PM300001. 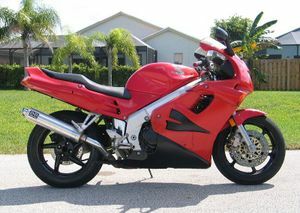 The VFR750F'95 VFR was sold in 1995 and was available in one color: Pure Red. 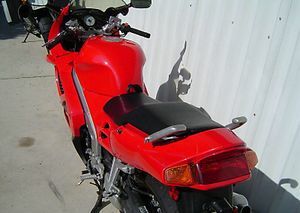 The serial number began JH2RC360*SM500001. 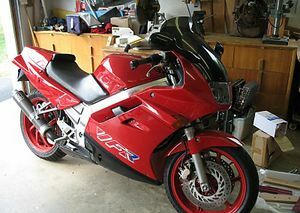 The VFR750F'96 VFR was sold in 1996 and was available in one color in the USA: Pure Red; but in Canada it came in silver. The serial number began JH2RC360*TM600001. 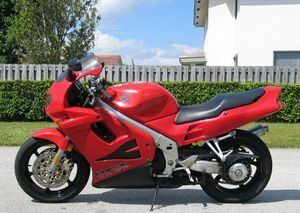 The VFR750F'97 VFR was sold in 1997 and was available in one color: Pure Red. The serial number began JH2RC360*VM700001. 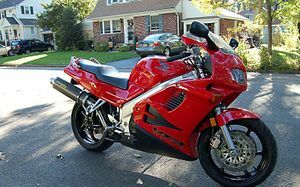 VFRDiscussion - For owners of the Honda Interceptor, for the purpose of mutual help concerning safe riding, maintenance, and performance of their motorcycles.